LAYTON, Utah - July 16, 2014 - PRLog -- Strategic Book Publishing & Rights Agency is pleased to announce the release of its newest title, Inside Hope, by author Krista Sieger. Inside Hope is a stirring novel about the war in Afghanistan. When their sons come home in caskets, the community of Hope reaches out to support each other in their grief. “I’m eighteen,” Eric states as he lies to the Army recruiter at Hope High School. A record 23 students enlist in all, but only 10 return home alive after deployment. Eric, who was killed in action, had predicted he would come home in a casket. This gripping action tale tells how the young soldiers deal with the fear and the dangers of war, how the families of Hope are able to rise above their loss, and how the returning soldiers cope with their challenges. Any American town might find themselves in this situation. Heartwarming to the end, the book also includes the thinking of one soldier who chose to go AWOL from her unit. Will she be able to find peace with her decision? 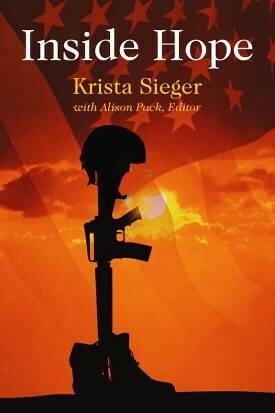 Krista Sieger was born in war-time Austria and has loved to write all her life. She now lives in Utah. With her family raised, she finally has the time to devote to writing, and her grandchildren were delighted to find themselves in her first book, asabirdie.com. The author and her husband have eight children of their own and they also adopted two sets of siblings, several of whom joined the Army and served in Iraq and Afghanistan. One of them, Eric, was killed in 2007 in the line of duty. Editor Alison Pack has a background in personal history production and was delighted to collaborate on this project. http://sbprabooks.com/KristaSiegerandAlisonPackor at www.amazon.com or www.barnesandnoble.com.